The McQueen is constructed using many of the same techniques used to make a LesPaul- but with chambering in the mahogany . The average weight of a McQueen is 6.5 - 7.5 lbs. When Mark set out to make a maple-capped guitar he decided the basic sound elements had to be there.. mahogany body & neck, eastern maple cap, TOM bridge and stud tail, humbuckers, and the same control layout as the classic, LesPaul. 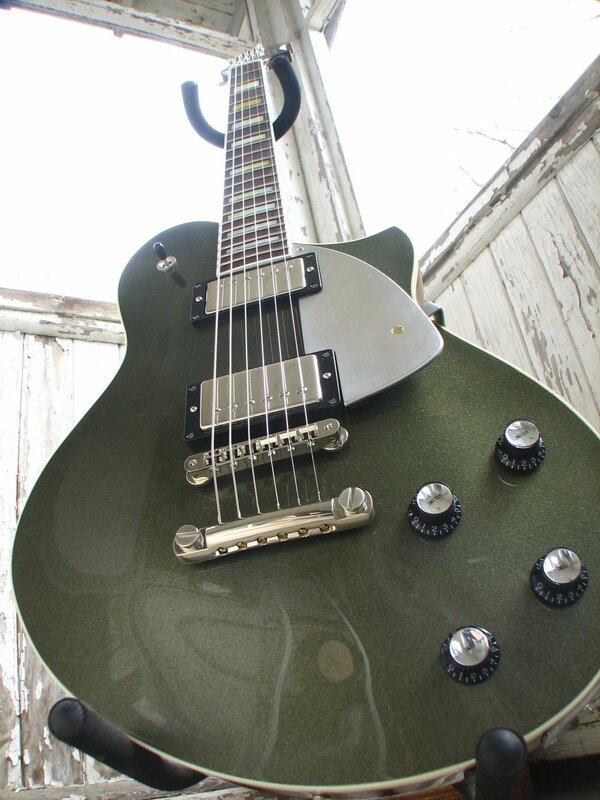 Of course he had to screw with the look, so he incorporated an old design and melded it with the basic LP shape, adding a 6-in-line headstock just to enrage the purists. (He's like that.) And surprisingly.. it worked! The McQueen is not a carbon copy of the originals, but it sounds quite a bit like them when the right pickups are used. It's a smaller, more focused sound, which is great for playing blistering solos and low register riffs. Because you're essentially 'muting' the guitar by laminating it, the result is often a less resonant, more controllable sound. Mark added tone chambers to his design, because he wanted a touch more resonance, but it's still makes familiar noise.